Finished, but for the finish, which will most likely be boiled linseed oil. For the inlay, I traced around the pieces with an exacto knife, defined the incisions with a small veiner, hollowed the background with a laminate trimmer, and cleaned up the shapes with chisels and gouges. 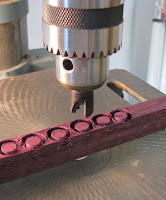 The small circles of purpleheart were made with a plug cutter at the drill press. The other shapes were rough cut at the band sa w and cleaned up with files. 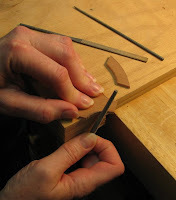 I filed a slight underbevel on the inlay pieces so they would drop into the recessed areas more easily. 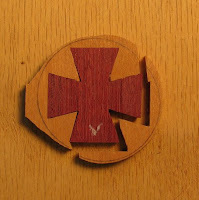 At first I made the center circle, inlaid the small purpleheart cross, and then tried to cut it out at the bandsaw, which caused it to split. Live and learn! 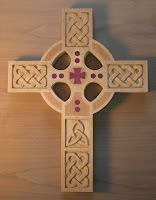 The better way was to first inlay the circle in the large cross and then inlay the small cross inside the circle. 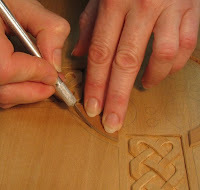 The other lesson I learned is to inlay the pieces first and carve the knots second. 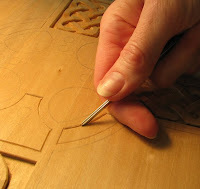 That way, you can plane the surface smooth before carving. 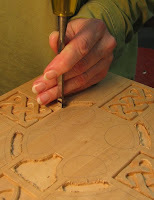 Since I carved first and inlaid second, the only way to flatten the inlaid pieces was with sandpaper and scraper. 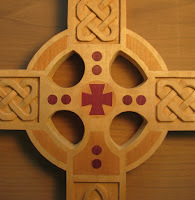 There are lots of errors on this cross—you can see gaps in the inlay pieces for one thing. But since this cross will be given to a church, I'm not concerned. They're supposed to forgive imperfection. It's like a rule or something. The gouges matched the various radii of the curves, but you could get away with using an exacto knife to follow the curves. I freehand cut the center circle in fact. 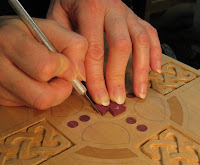 The bent chisels were used to flatten the recessed areas behind the knots while the straight chisels were used to clean up the recessed edges of the inlay and carve the flat surfaces and chamfers on th e knots.